Although the simple pentagon design was most efficient and effective, architects, nobles and burghers usually did not have the luxury of starting from scratch but instead had to strengthen pre-existing towns and cities with the new design. 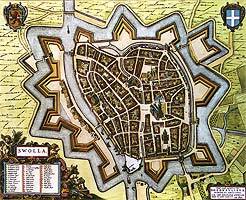 Enclosed City of Zwolle, the Netherlands, from a facsimile publication of the Blaeu's Toonneel der Steden, 1652. To view a detailed map, click on that image above. Some (but not all) towns and cities already had walls left over from the Middle Ages. Even those with walls, many had outgrown their boundaries and/or let them crumble with age - or torn down part of the walls to make way for urban expansion. As we've already seen, though, these surviving walls were woefully inadequate. They needed reinforcing - lots of it. In light of cost and land use, the Trace Italienne concept could only be cobbled onto a community's perimeter. Bastions and ramparts had to be placed where reality dictated, not where theory proposed. Not surprising, the rambling perimeter compromised firing lines – and communication and supply lines. Not to be overlooked, cannon and musket required wide, open, unobstructed fields for shooting, but many towns had houses, market areas, mills, even churches scattered out from the town core into the countryside. Enclosing these outlying buildings was cost-prohibitive but leaving them standing spoiled the shooting. Many towns left these outlying buildings to stand – until an enemy army showed up. Oh, the arguments that must have boiled about whether to tear these down or leave them to shield besiegers. That sort of situation added to the Trace Italienne concept suggests an overall drawback to these new forts: they required much more real estate than the old castle. Even the walls themselves robbed space. Compare the two, three or so meters thickness of a curtain wall to that of the 8-15 meters of the rampart wall. Bastions doubled that or more. Then came the ditch or moat, then the broad field that had to be flat and bare for defensive fire. Any community had to relinquish much habitable land to its defense. For this and other Dutch city maps there is a facsimile publication of the Blaeu's Toonneel der Steden from 1652. There are 35 maps illustrated and may be available from the University of Groningen.